Steve Anderson with Clean Water Services (Hillsboro, Ore.) wrote the song, “Don’t Flush the Baby (Wipes! ),” to convey the importance of not flushing baby wipes, cleaning pads, and paper towels. Photo courtesy of Gayle Leonard/ThirstyinSuburbia.com. 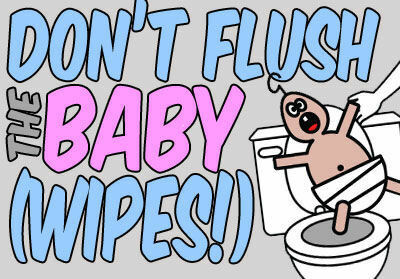 Steve Anderson, a water resources analyst with Clean Water Services (Hillsboro, Ore.), wrote and recorded a lighthearted song called “Don’t Flush the Baby (Wipes! )” The song conveys the importance of not flushing baby wipes, cleaning pads, and paper towels. Although not part of a Clean Water Services’ outreach campaign, Anderson has produced a number of songs as part of a side interest in leveraging humor to convey messages about key issues related to wastewater and water quality. “Humor has a way of resonating and grabbing people’s attention, which can be very effective for reaching the public,” Anderson said. As the nondispersibles issue continues to grow, utilities are turning to humor and lighthearted messages to educate the public. In the footsteps of the Singing Sewermen from Thames Water (London), utilities are creating unique and humorous public service announcements (PSAs) and campaigns to educate the public about what can and cannot go down the drain or toilet. Find WEF Highlights articles featuring these efforts by searching for the keyword FlushablePSA. Have a unique flushable PSA to share? Send it to Jennifer Fulcher, WEF Highlights editor, at jfulcher@wef.org.